June didn't really get to try her double lift this morning. While she was still on her first outrun, the setout lost her sheep. They regathered them just as June got to the top (which was good!) 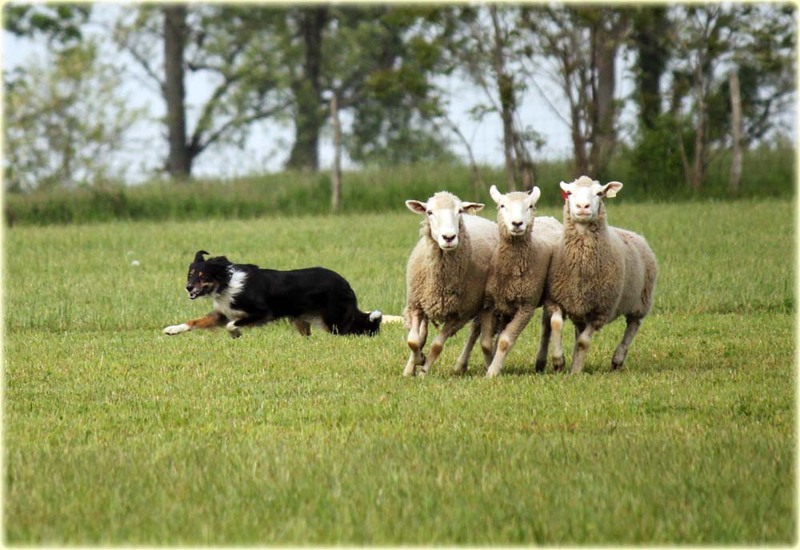 but then they couldn't get the set out dog to call off the sheep and as June lifted them it squeezed the sheep between the two dogs and a single squirted off to the set out. 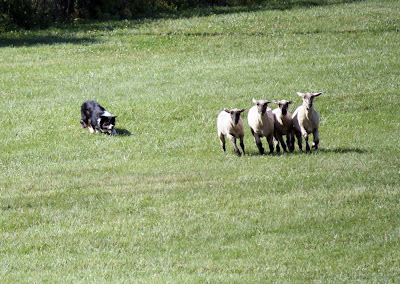 While June was trying to gather them all back together, still at the top, they brought out her second set of sheep. 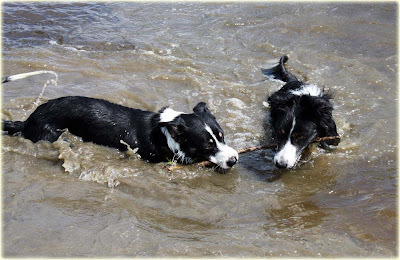 I'm sure it's no surprise to anyone that although June was trying her best to keep them apart and move the first set towards the fetch panels, (the single had already joined the second set) both groups joined up. Scott called her off assuming he'd have another chance on her rerun. They decided to send up some open handlers to help out and that fixed the problem but the judge decided not to give Scott and June a rerun. Vergil and Brooke had a nice run but were topped by Linda Fogt and Jill. Linda had to retire her good dog Annie a couple of years ago but she is certainly back on top with the new girl! We moved on to the nursery classes right after. Friday's nursery didn't have as far an outrun as we did today. Today the dogs had to run the open outrun but they had a shortened drive. 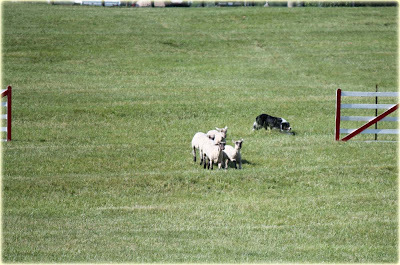 There were alot of dogs who didn't find the sheep with this outrun, and a couple of handlers scratched when they realized it was difficult. Bliss had a very nice run this time. She kept her flanks open and was nice and smooth, making all her panels and pen. She ended up with an 81.5 placing in 3rd. Ford ran shortly after her. He started his run nicely but the finish drove me batty. He went out on the big outrun (about 400 yrds) and only asked for directions once. Not bad for a dog who was running tight just a few weeks ago. The sheep left a little early but he caught them before they went too far. He missed his fetch panels but made the difficult drive away. However, we missed the crossdrive panel but I wasn't too concerned about it. I was concentrating on setting up the pen so he would quit his racing around it. 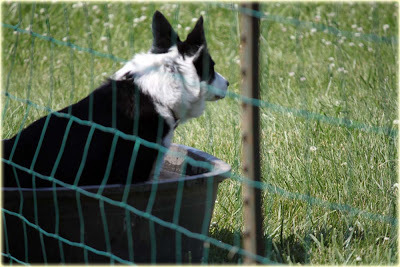 I kept it calm and got a nice stop in a good spot that put the sheep in the pen. 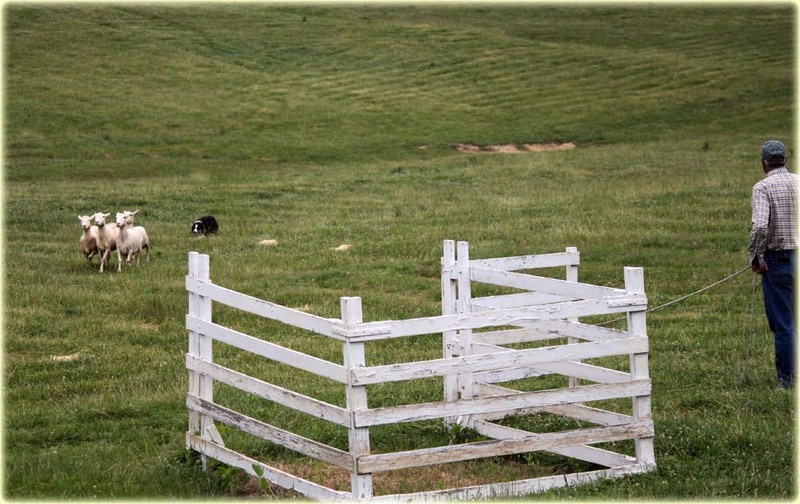 I didn't want to immediately close the gate for fear that it would push him to the back of the pen as I stepped toward him. I didn't get the chance before he picked his head up and raced around the back of the pen and pushed the sheep back out. We set it up again, and penned again but this time he blew through my stop and just went to the back. I slammed the gate and tried to bring him around the front to stop before I took the sheep out but I couldn't get him to stop. Ford blows me off at the pen! I was reduced to begging and then when I finally sent them towards the exhaust, he went and gathered them again. By this time I was losing my cool. I tried to chase him off (apologizing to the person in exhaust) but he went to gather again! Finally, after I was thoroughly embarrassed, Ford spotted the water tub and went in there where I caught him. 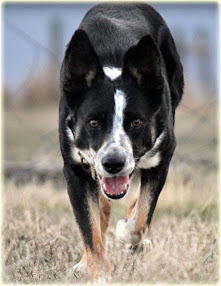 I took him away and put a long line on him and worked on his lie down and recall before his run in the Open Ranch. He was contrite and I thought our next run would go better but it was even worse. Around the course it was the same (except a better outrun) but his blow off at the pen and his recall when it was over was even more humiliating. We have some work to do before his next trial in NY. For right now, he's off the spoiled list. He's not getting the extra attention that my dogs usually get and it will stay that way until he shapes up and earns it again. 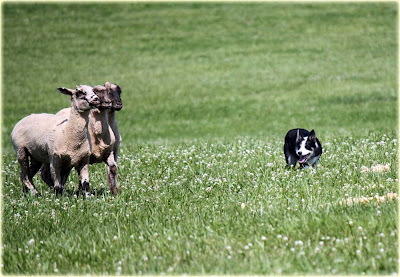 Tex didn't find his sheep this time with the bigger outrun and although Scott gave him a good chance, he had to retire him. Wynn got lost on his outrun and crossed but the rest of his run was very nice. He ended up with a 55. Jane was a superstar and won it smoothly and got her first finals leg! 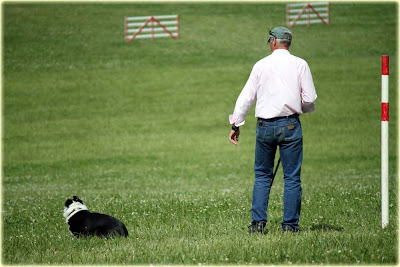 In the open ranch, Nan had a beautiful run but Scott tried to get fancy and in attempting to make a tight turn around the drive panels, he turned just short and lost 18 points on his drive to get a 67. Bliss took 3rd in the class with an 80.5. It seems she is remembering to open her flanks again. It's a good sign since Scott plans on taking her to the nationals. In the Pro Novice, Scott ran Tex who looked great again - and took 3rd in his class. Jane was a good girl, but drew one of the few high headed sheep that were not going to go in the pen. 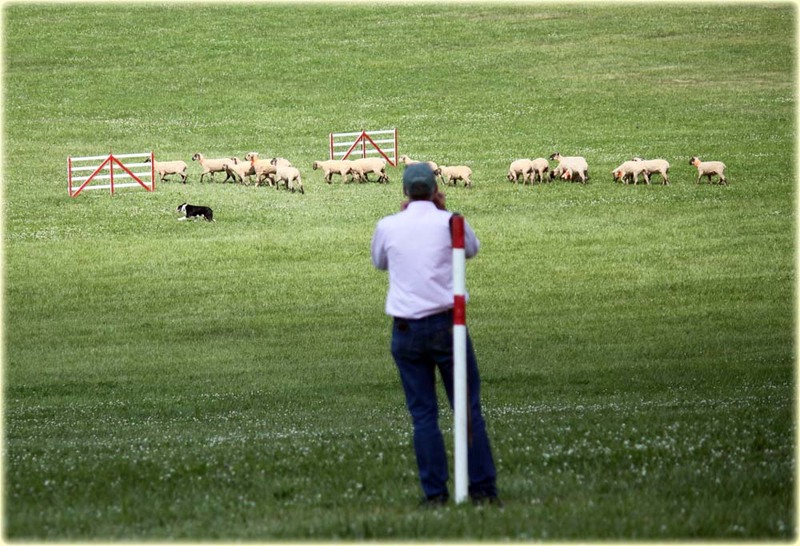 Most of the sheep penned as long as you stayed out of their way but every 20 runs or so, there was a ewe who wasn't going to go in the pen and Jane drew it this time so she didn't get them in the pen. We were proud to cheer on a brand new trialer in the Pro Novice today. Tobie O'Dell has bought Marianna Schreeder's old Nan dog and they did a great job for Tobie's first time ever at the post. Nan ran a little wide but Tobie called her in and they had nice lines, just missing both of their panels at the last minute and closed the pen door to the cheers of her fan club. We look forward to catching Tobie down the road as she moves up in this sport. 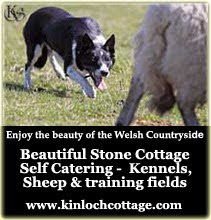 We are off to New York next to Roger and Heather Millen's Fetch Gate Farm. Scott will be teaching a couple of clinics and there will be a small nursery trial. Hemp was better under control today - I put him on his belly at the top instead of letting him walk in on a steady whistle. There were two major mistakes in his run today and they were both made by him. Just before we turned the post, he ducked the wrong way and sent them the wrong way around, and just in front of the drive away panels, he read the pressure wrong and took a flank without being told, and it happened to be the wrong flank so we missed the panels. He also glanced behind him on the shed, like his niece, but then focused on the right one. He got an 85 today. I was very happy with Laddie today! He handled like a dream and did everything I asked and he controlled his drive away line by himself. He seemed to be reading the pressure of the terrain very well so I decided to trust him and gave very little guidance. Scott said we lost most of our points on the third leg of the drive. Because it was a pen and then shed, I had to walk from the post to the pen while I was trying to find the line on the third leg of the drive and apparently I cannot walk and chew gum at the same time. He did have a nice pen and with 3 minutes left in the shed, I waited for the perfect opportunity and set it up just right so Laddie couldn't fail and he came in nicely and took a very good single for a 91.5 and 6th place! The best part of that was earning another 8 points which now brings us up to 22 + points. We started this trip with only 3 points so I'm proud of him and we should have enough to get in the Nationals now. Donnie didn't have a very good start to his run today so Scott just trained on him a little bit down the terraced fetch and then walked off on the drive. 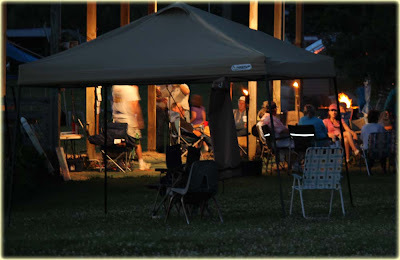 A delicious dinner was served to us with a festive atmosphere of tiki torches and a bonfire, and the the party went on long after dark with plenty of volunteers for Karaoke. Tomorrow, we have the 3 double lift runs in the early morning and then start the underclasses to finish the trial. Scott and Don were second up and the sheep were not as easy in the cool of the morning as they were in the hotter afternoon. It's very important to cross every T and dot all your i's because this trial traditionally scores high. Don made a good go of it after he got his sheep back on line on the fetch but he scored an 81 which didn't even make the leader board! 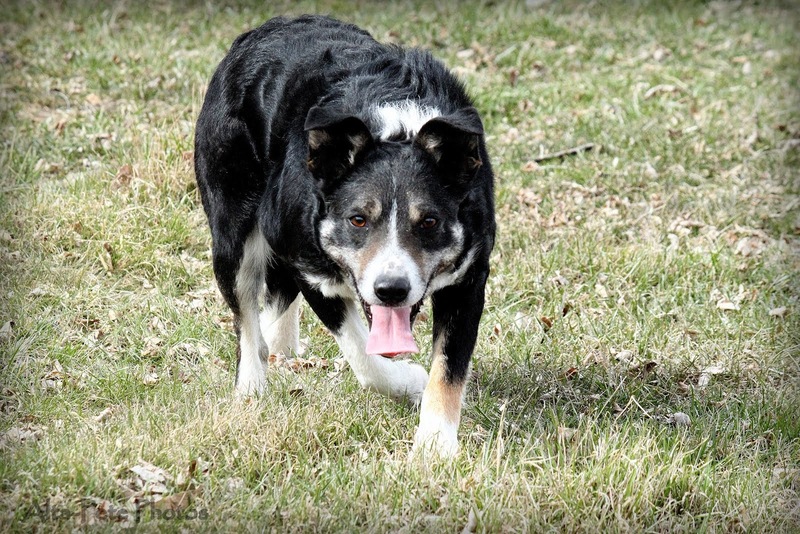 Laddie was running well and had a nice outrun, lift and fetch. His first drive line was very good but he was a little low on the crossdrive and missed the panels low. You just can't stub your toe like that at this trial and that, along with the missed attempt on the shed, hurt us and only got a 76 from the judge. The prettiest run of the afternoon was Virgil Holland and Brooke. When I tell you there wasn't much wrong with it, I mean that literally as he scored a 98.5 out of 100! Everything just worked so well in that run. Hemp was an a**. I don't know if neutering is going to help any since I'm not sure how to fix his problems. When we are practicing, he has the prettiest pace and works so well with me but at a trial, he just runs through it and does it his way. It's not like I don't leave the post when it's going bad but he just gets so amped up. I'm just glad Ford is coming along. Hemp made all his panels, had a missed attempt on the shed and screwed up a virtually un-screwable pen for an 81. (except one small thought that obviously crossed her mind on the crossdrive but she was too far back to cause any problems with her line). Most of her points came off her shed because Scott took the front two instead of the back two and she lost 5 points. They ended the day with a 90. Ugg, I love this trial but it is HOT! Fortunately, the original forecast of 90 has been downgraded to 87 tomorrow so I'm hoping they'll keep dropping it! The humidity is hard too but if the dogs keep their heads cool, they'll do ok with the katahdins and there is water on the field. Bruce Fogt is our judge and we started tonight at 4PM with the first nursery. We won't do another nursery until Monday but it's nice to sneak in an earlier one today. 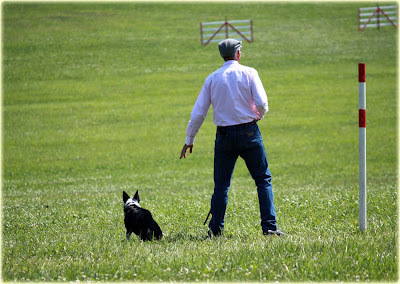 The class was won by Chuck Dimit and his very nice nursery dog, Chad, who is the same way bred (and as nice) as his 3 legged dog Coal. Second was Scott and Diane Pagel's Wynn, who wasn't far behind Chuck. Wynn had not much wrong with his run, with a nice outrun, made all his panels and his pen, getting an 82. 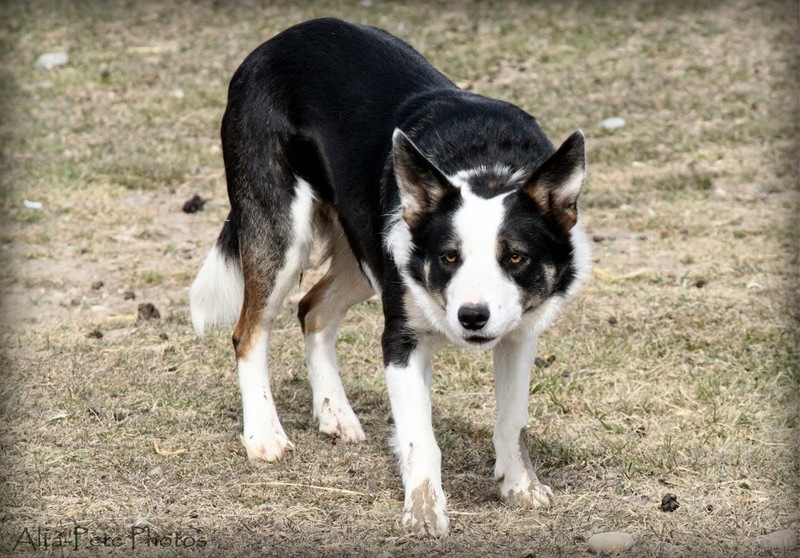 Third place was nabbed by Scott and Missy Parker's Tex. Tex was a little shallow at the top but once he had that fixed the rest of his run was as good as Wynn's and also earned an 82. Scott and Marianna Schreeder's Jane were working well but once in a while there is a tricky ewe in this flock who doesn't like to pen and makes herself known as you progress around the course. Jane drew this ewe and although she tested her, she did a nice job. The ewe ducked around the wrong side of the post and then at the pen she just wouldn't go in, even though most of the sets penned quite easily. They ended up with a 61. Scott ran up the field when Bliss ran a little tight on the hill (it's a terraced hill so most of the dogs did a good job just getting it figured out) and then after the sheep left early (because she was a little tight) and she caught them, she came in a little fast and tight. He was able to make sure she knew she needed to open up before he walked off. Ford did the best he's done! His score was only a 53 but I was really happy with him. He asked me for directions once on his outrun but then got up there the rest of the way on his own. The sheep left a little early but he wasn't that tight so they didn't go far. 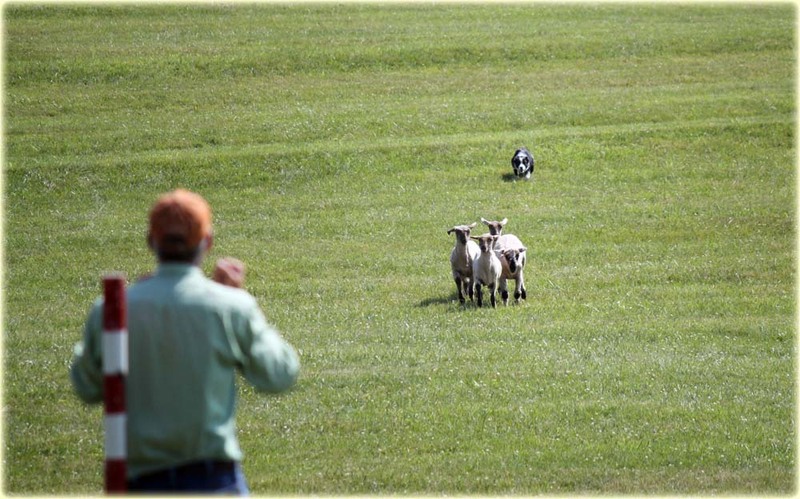 He found the set out person and figured they should have his sheep and stopped, looking around for them, but when I flanked him over, he started to look around a little and saw them. Our fetch was a little off the line and we didn't make the panels but it was nice and controlled with good pace and I didn't think I needed to press him at this point to make the panels. We took it slow around the post and actually had a nice drive away line and made the panels. I had to talk him through his crossdrive flanks and he didn't do too badly but we were a little low on the line and missed the panels low. He got a little excited when we made the turn for the third leg of the drive (probably because I got a little excited - our second chance at a pen!) 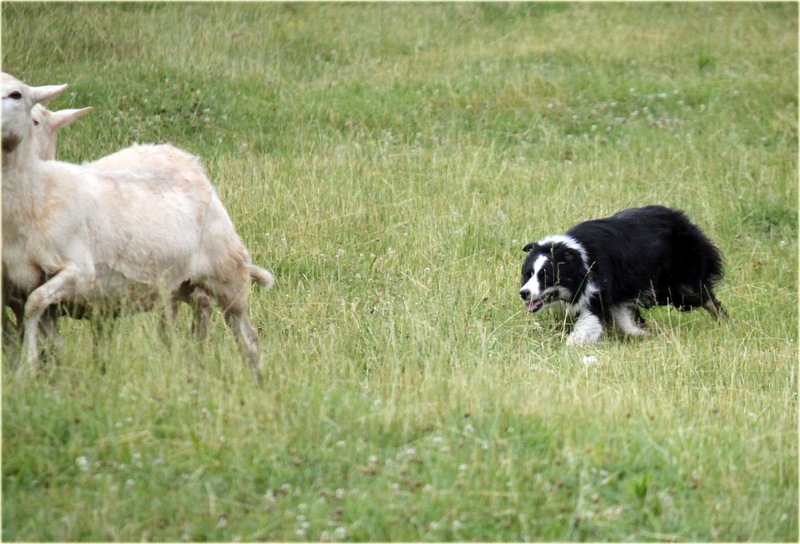 but I settled him down and just as the sheep walked in the pen, he panicked like in the last trial and ran behind to keep them out. 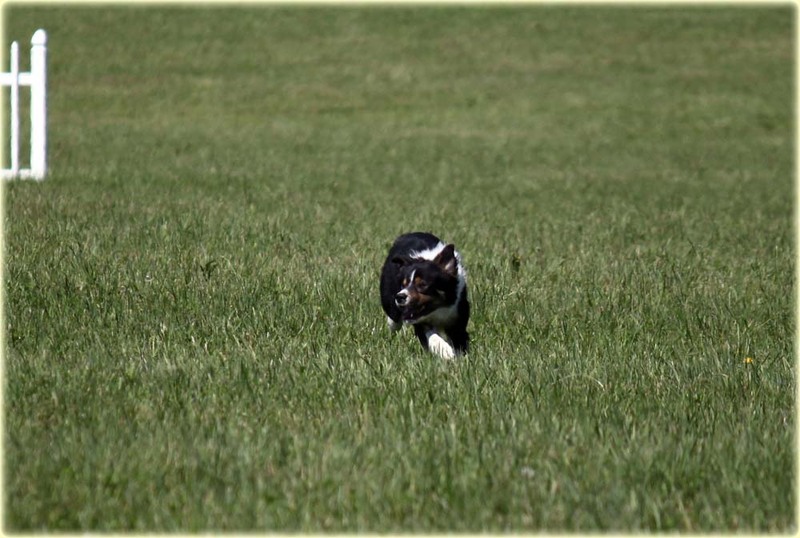 We had to repen them and I got the gate shut but he still ran around the back. I made him come to the front and stop before I flanked him behind to put them out again. I'm hoping I can get a little practice in on a pen when we get to NY, before the Fetch Gate Nursery in a week, but other than that, I'm feeling good about his progress. If you didn't follow my updates on Facebook today, I encourage you to check it out to get summaries on all the runs including June and Don's. June finished her first double lift in 11th place and Donnie, although he was giving a nice run up until then, gripped on the third leg of the drive. I took some pictures of each of their runs, including Donnie's very well done crossdrive panel. This is why June missed the crossdrive panels! Scott has told me that June did NOT miss the fetch panels. There. I have fixed it. Was awarded to Missy Parker's Tex - handled by Scott! 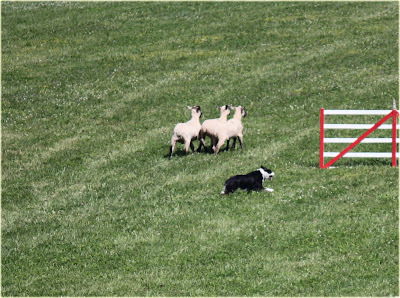 June had a good outrun and slammed down a little close to the sheep at the top but she quickly made it right with them by backing off and opening up her flanks. They missed the fetch panels but made both drive panels. She was treating them nicely in the shed too but they stupidly gave her a challenge. She kept her mouth shut even though I think they were making insults about her mother wearing combat boots. Her confidence has really come up during this trip and she isn't as quick to grip as she used to be. She got her shed but couldn't get it done at the pen. Scott decided not to push it too hard and risk the grip that she'd been avoiding but they almost got it done. She got a 73.5 and got herself in the double lift! June will be in the double lift! The way Hemp had gone in his last run I wasn't expecting much from him and he didn't give it. He wouldn't take my away flanks. It was hot and he was happy just walking behind them and he didn't really care where they were going. We missed the panels but I got it back under control and we were having a quiet turn around the post. The sheep were behind me when one jumped back the way she came and ran in front of me to rejoin her buddies after they had turned the post. I thought for a second what I was going to do about it and then I retired. We didn't have a score from the day before so there was no chance at a double lift, he wasn't listening so I could only imagine what the rest of the run was going to be and we had just lost too many points to get in the prizes today. Plus I wasn't sure if I should go on (and possibly get a DQ from one judge) or wind them all back around the post. It was too complicated to keep going so I retired. Besides, if I was confused, I'm sure the judges were too and Scott always says, "If you confuse the judges, you are going to pay." 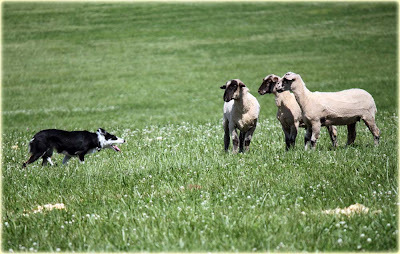 Wynn had some more good training in the nursery field today but Bliss is going to need some more work (which she'll get while we have a few days off in Tennessee). She started out good but she has less training than the other nursery dogs in our kennel and it's starting to show. Tex was brilliant again! He tied for second with Bev Lambert's Joe dog who is also running in open. I'm not sure who got the higher placing. Lyle Lad won the class. Fingers crossed for a good draw for Scott tomorrow!!! Oh, I'm afraid I'm not going to be a very good reporter since I didn't see too many of the runs today. 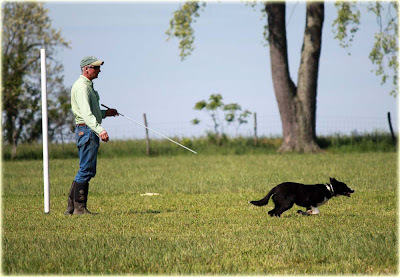 I know that since Scott has Wynn and Bliss qualified now, he spends more time trying to train on them during the trial and making sure they do it right, rather than going for the win. However, Tex still needed a second leg and he did a great job and got a 79 and took second place which is his second leg! He really looks like a nice dog to handle, listening and responding to all of Scott's flanks. Bliss beat Wynn today with a 67 and he got a 59 but like I said, alot of what Scott is doing is training so they are good and ready for the finals. Jane did ok today and got a 66. Scott said she is doing better but I know she's a little frustrated on these sheep and I don't think it was good enough for a leg. Wynn also took third place in pro novice. Don's run was very disappointing. He again got very difficult sheep. Actually, this time is was one bad lamb and the other two weren't too bad but of course, her lunacy made them all stressed. They busted down the fetch line again and just barely missed the panels but were very difficult to get around the post. The crazy ewe kept busting back to try and jump into the spectators arms. It was a long and tense moment while Don continued to flank out, catch her and put her back with her sisters, just to have her do it again. They were crazy up the drive line but made the panels and crazy across the crossdrive but again made the panels. Got a shed but it wasn't a really good one, and had a tense pen. His score was only 60.5 All we can do is wait to see how it holds up with his 83 and keep our fingers crossed it was good enough to get him in the double lift. He ended the day still in 4th place over all. Laddie ended the day and ran his heart out for me. He was so responsive and polite to his sheep. He missed the fetch panels but no one would have guessed that was going to happen as they were dead on and just ducked out of the way on the last minute. 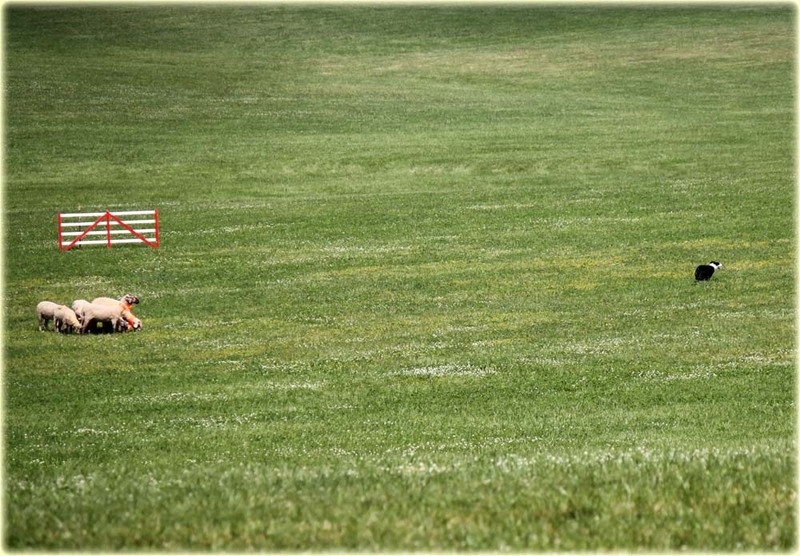 The judges didn't like the lower half of his fetch but he had a good turn around the post and a very nice drive. In the shedding ring, he was very good and came in but glanced behind him after he turned on the single. Because of that, the judges waited for him to look back at his single before calling it and she got close to the fence and threatened to go over. I thought maybe I should just have him go back for the other two who were patiently waiting just outside the ring. 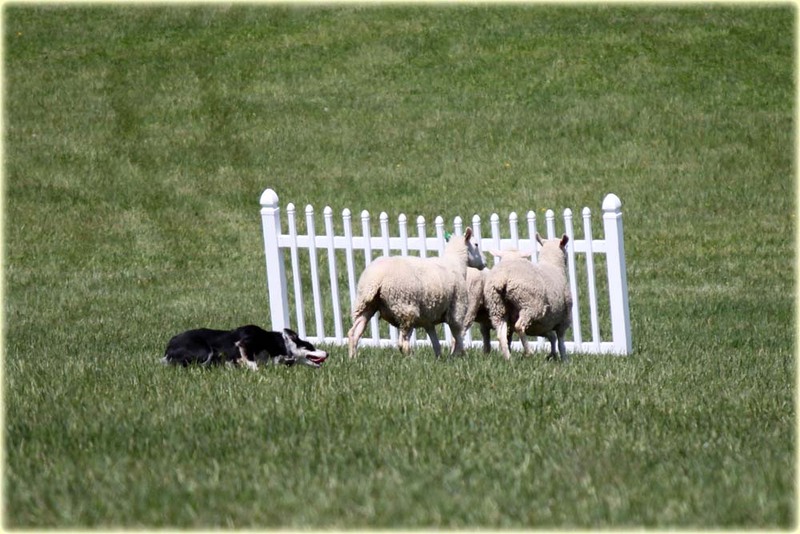 So he turned back on them and I made sure he gave them plenty of room so they wouldn't get spooked but even though he was way off and lying down they popped over the fence and into the spectators and it was over. The audience groaned and then applauded us to help with the loss. 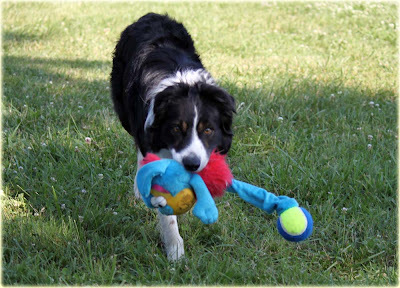 Laddie didn't know there was an issue but I went and got him a new toy anyway and all was well in his world. Well we had good things and bad things happen today. I'll start at the beginning. On the underclasses field, this morning was a blood bath. 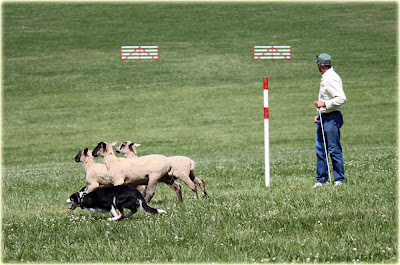 In Open Ranch, there were very few runs that even made it down the fetch line. 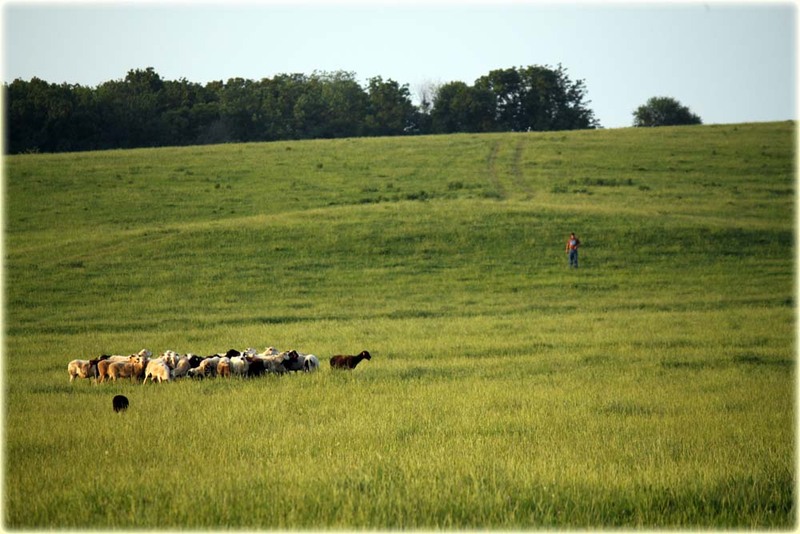 The sheep are the same sheep from the open, only this year, they have never been worked- were shorn right before they rode on a truck up here from Texas that was stuck on an interstate for several hours and then were rained on the night they got here. They are not happy. 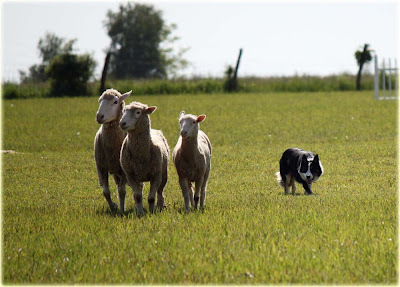 Fall brockle faced wool lambs who have no idea what they want to do but they know it has nothing to do with the dogs that keep bothering them. Scott sent Nan to the right and she pulled up short. He blew her over but she pulled up short again. 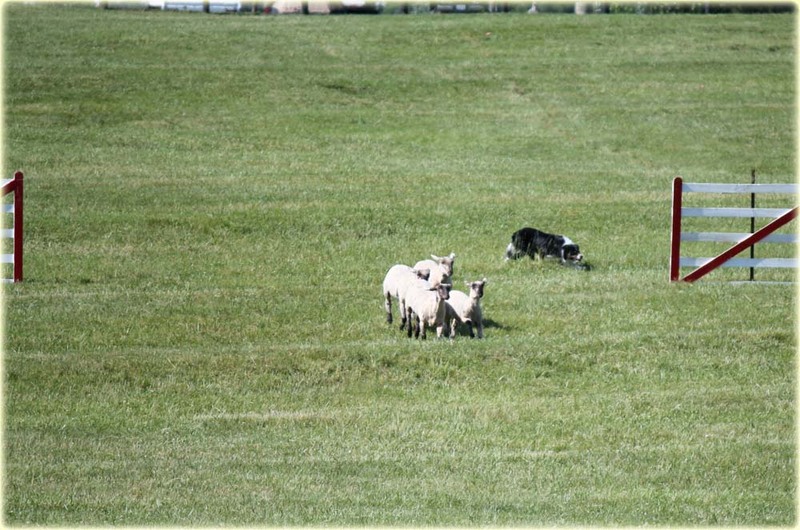 It was unusual for her to do this but the sheep ran back to the set out to the handler's left and that was the end of that run. Because it had just been a disaster for the runs before Ford, I decided to send him and immediately run up the field. I could keep his outrun honest and make sure his first contact with his sheep was good. He had 7 more runs on this field this week and I wanted to make sure the first one wasn't a disaster. He had a nice outrun and I was at the fetch panels when he lifted them. 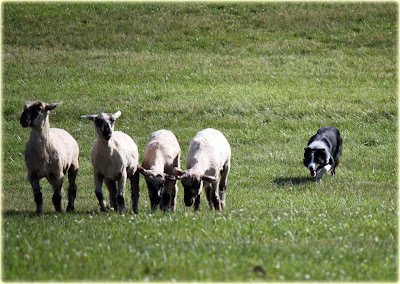 On our fetch down the field, I realized that although he didn't have real open flanks, he was opening up to cover the sheep who were constantly trying to go around him back to set out. He did a nice job and we got them exhausted. I felt pretty good about that and vowed to let him do it by himself that afternoon in the nursery. Scott then ran Bliss. She looked really good! 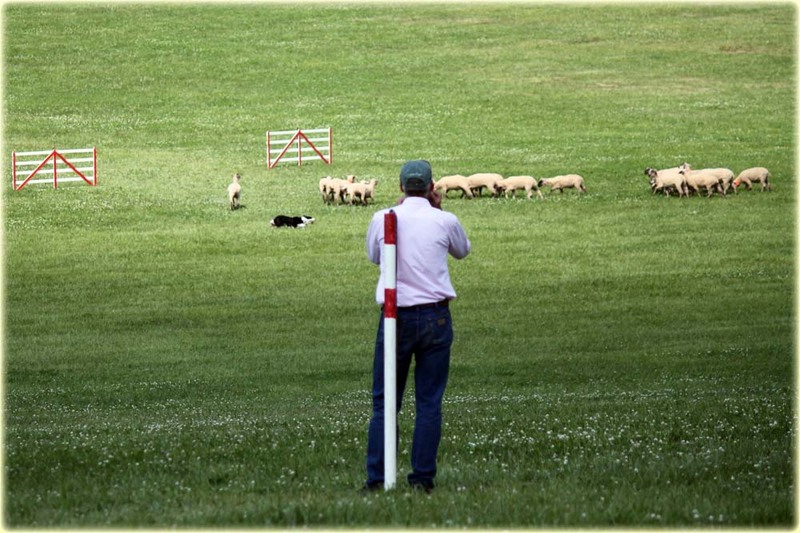 I was very surprised but her open flanks and patience made the sheep very comfortable with her. She got only a 54 but it ended up in 3rd place. 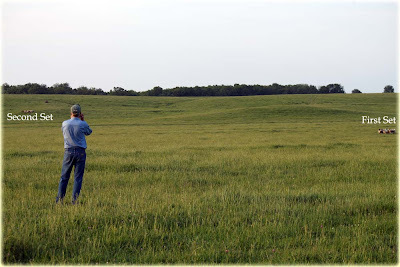 Over on the open field, Scott ran June. She did a great job but the sheep just didn't cooperate. They ran almost the whole way and on the drive away, she and Scott handled a very difficult drive away panel in a clever way that I couldn't even explain. Unfortunately, the sheep were still very jumpy by the time they got to the shedding ring and it just didn't happen. I am having trouble accessing the scores. 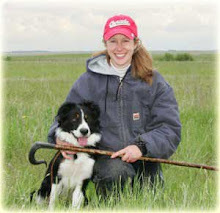 They are on www.dogtrialentry.com but they don't seem to be working so I will give you the link when I figure it out. I think June got a 54. Lad then ran on the open field. I didn't think anything good was going to come of it because he hasn't been shedding and the judges were making you hold the shed for a VERY long time. Kiss of death for Lad. He struggled on the fetch but it was probably due to the fact that the run before ours took over 10 minutes to exhaust while my sheep contentedly grazed at the set out post. 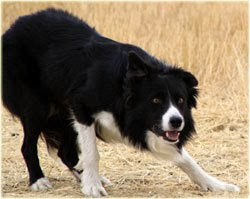 By the time Laddie got there, they really didn't see any reason to come down the field. He got them down but it wasn't pretty and we missed the fetch panels. 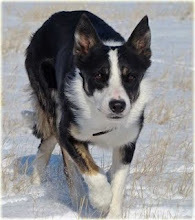 We had a nice drive and I was pleased with him but the sheep were running and Laddie loves running sheep. When they got to the shedding ring, I took a deep breath and tried to not worry too much about it. 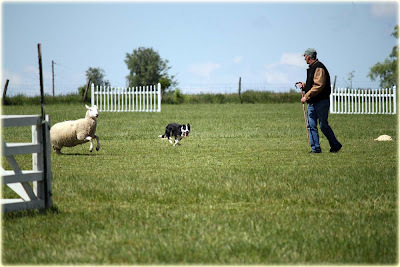 Fortunately, the sheep gave me that shed by having one hang way back, Lad came right in but kind of floated about between the two sets until I "shushed" him onto his single and he not only focused on her, but dodged over and held her when she tried to break back and the judge mercifully called the shed. We headed over to the pen. Scott said we rushed it a little bit and we didn't get it. I was a little worried when there was some sort of chaos behind the pen that looked alot like it could have possibly been a grip and I wouldn't have been surprised if one of the judges had DQ'd me. They don't know that Lad isn't a gripper but even I couldn't really tell you what went on back there. I know that my final score was a 68 and that wasn't bad at all for today. On to the nursery. I didn't see Bliss but I hear this time it looked good again and she got another 54. However, I think it dropped to 4th place but I think she got her first nursery leg. 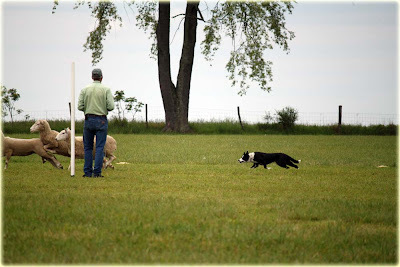 Jane was pretty grouchy about these sheep and kept trying to get a grip in but she never quite got it done and Scott felt like he got some good training on her. She didn't get any placing but we are hoping she will be better when she runs tomorrow. 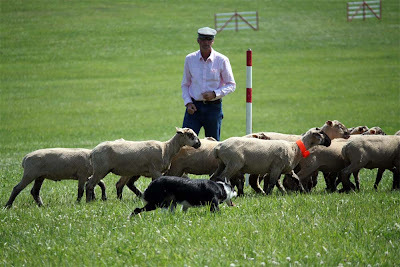 Wynn didn't believe Scott when he told him to widen out his outrun and he almost crossed but then got out and around his sheep with a nice deep lift. It was looking like it was going to go very well until the crossdrive panels when he started to argue with Scott about which flank was appropriate to make the panel. After arguing for a few minutes, Scott retired him. Ford ran last in the nursery and he went from hero to zero today. I have to preface this story by going back a few weeks. If you didn't read on facebook, you wouldn't have known that I had gone to a friend's farm to get Ford out on light sheep and a new field. Unfortunately, he didn't get to work the light sheep he worked some head hunters that plowed him into the ground. At his age, this is disastrous and Scott and I had to work quickly in the couple of days before we left to try and build his confidence again. He needs to learn to grip but we felt that with his first trial one week away, it wasn't the time. 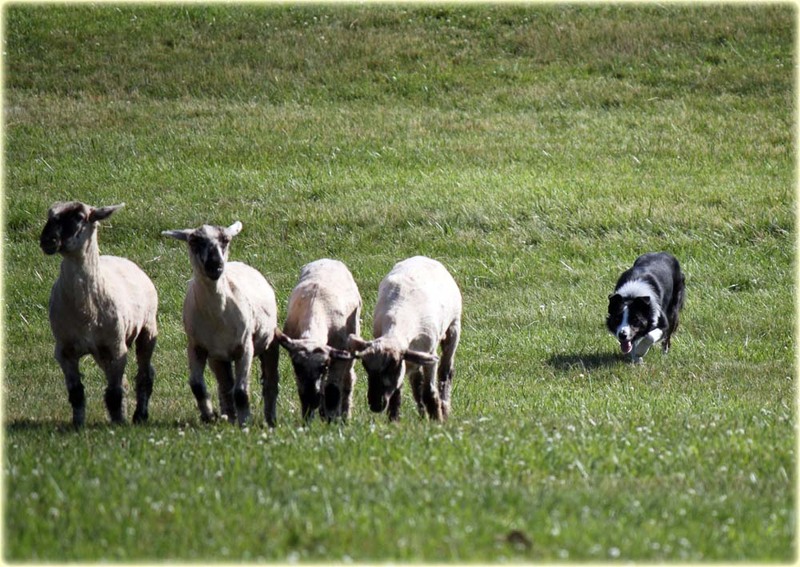 He didn't have any trouble in those first few trials but with these difficult sheep today, it showed up big time. I sent him to the left and he did a nice outrun, and stopped behind his sheep. 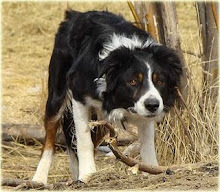 Then he lifted them and started on his fetch, but before he got very far, there was a banging in the pens behind him. 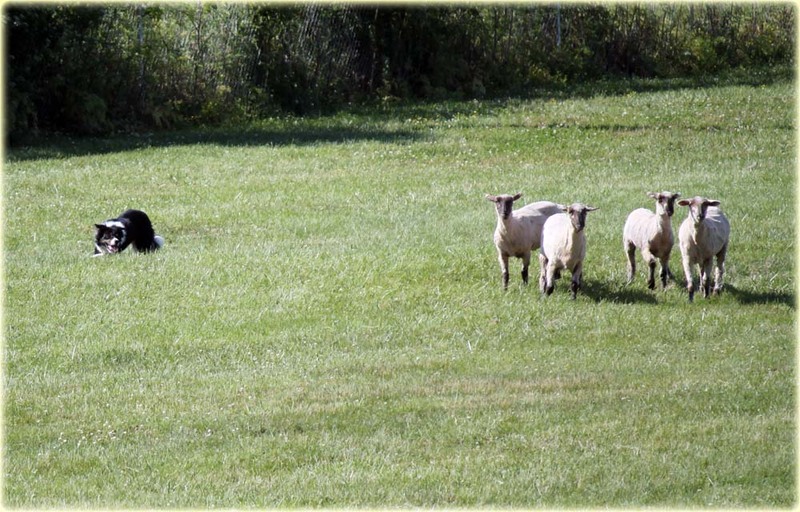 I don't know if this scared him or if the sheep thought they were going to get to go back to set out and started leaning on him, but he left his sheep and came running back to me. I sent him back up there and walked up the field. 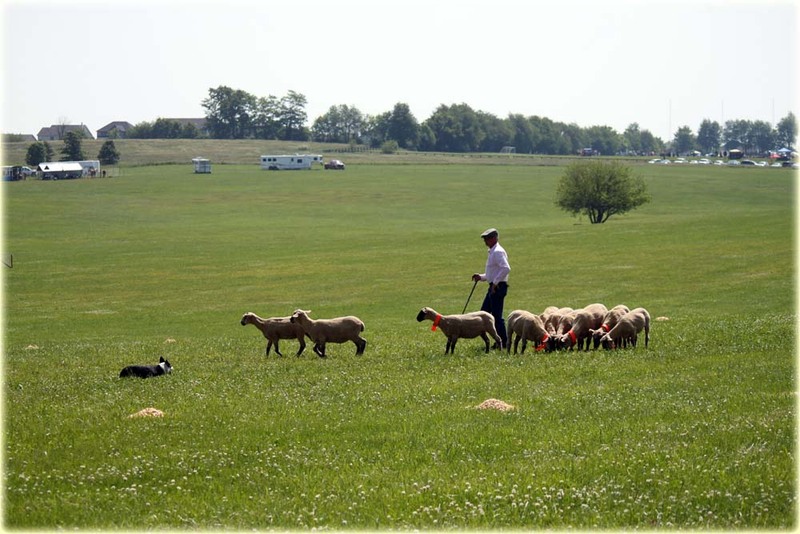 The sheep ran back to the set out and Ford actually went back and lifted them several times off the tarps covering it but he could only get them a few yards. 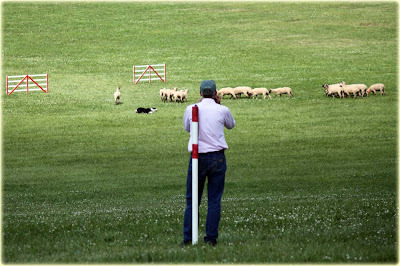 Then the sheep stopped bothering with him and he got worried and tried to circle instead of helping me drive them down the field. The set out people had to help me move them down the field. After his run, when he cooled down a little, he was ready to exhaust the next run and cut in a little as he went around them, cut out a single and NOW was going to bite it on the shoulder but I had to settle him down since it wasn't the time or place. 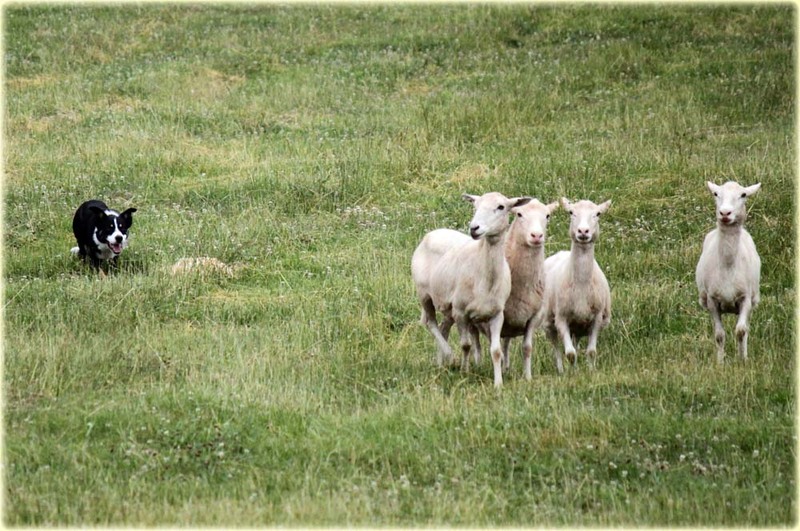 I was very disappointed but not really surprised after he had been pummeled by the sheep before we left. I will give him one more chance tomorrow but if we have similar problems, I will pull him from the rest of the runs and try him again in NY where I know the sheep will come down the field. Poor Ford it blew his little mind! Thank goodness for our young dogs. They redeemed the kennel's status.We started the morning with the nursery class. Scott ran Bliss first. 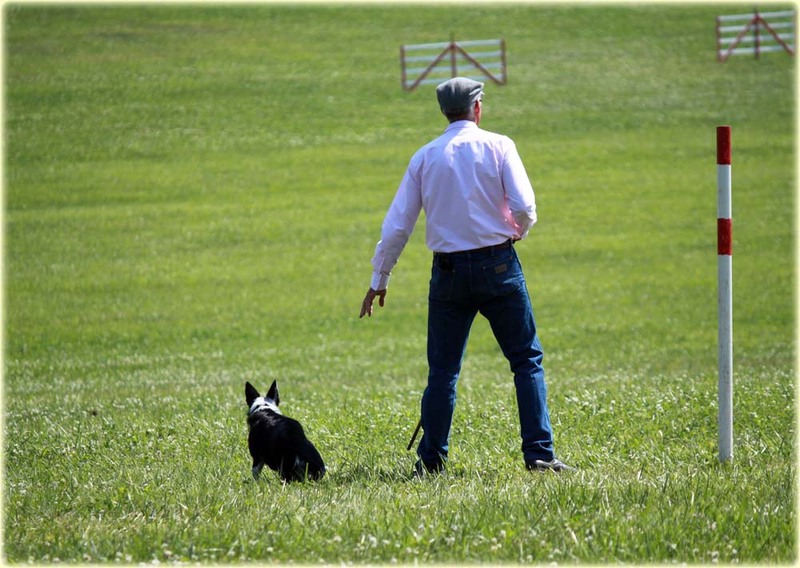 Scott said he wasn't disappointed with Bliss but she missed her fetch gate and ended up in 5th place with a 66. Then Lori Cunningham ran Ford's sister, Anna and the showdown was on! This is Anna's first time to the post and Ford's 3rd time. Both pups are just getting experience and we were having our own competition between us to see which pup could get the farthest in the course. 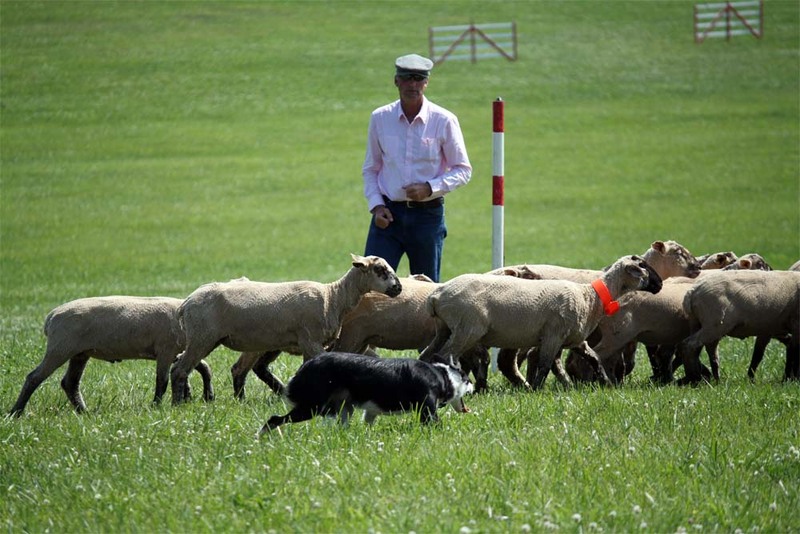 The pressure on the right hand side of the field was strong and it helped the dogs to be more open to the left but the sheep were often leaving early if you sent to that side. So Lori sent Anna to the right but Anna quickly disagreed and crossed in front of her. As predicted, the sheep left early and ran back to set out. Lori retired her run and started to walk up the field to help Anna but before she could get very far, Anna picked up her sheep and brought them down the field. It was a positive end to Anna's first trialing experience. Then Ford ran. I was able to keep him on the right side of his outrun, but he was a little tight and didn't bend very far when I asked him to. He pushed his sheep off a little bit to my left at the top but when I blew his stop whistle, he stopped on a dime and stayed down. This was the biggest new step for him! We worked all week on stopping at the top and not popping back up. He took every stop all the way down the fetch but he doesn't have open flanks so he was not able to get them on line until shortly in front of me. He turned them around the post and we started on the drive. 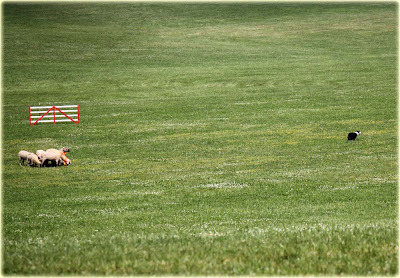 The line wasn't good but he took the flanks and the stops and the "there" commands like a good boy. We made one flank too fast and ended up turning short in front of the panels. Even though I knew we were not in competition with anyone (well, except Anna and we'd already won that contest) it was tempting to try again to hit the panel. However, good sense won out and I remembered that most importantly, this needed to be a good experience with Ford. 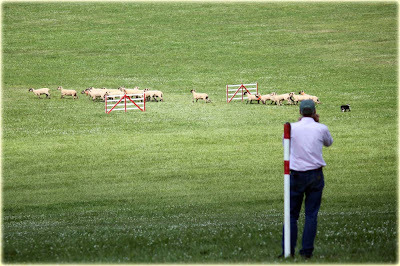 The sheep had helped us with the turn, unlike in our last trial, and they trotted down the cross drive line. Ford didn't have to push, he just had to follow and take a few flanks. 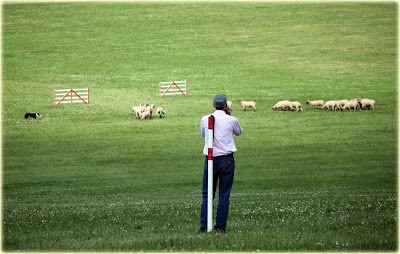 We missed the crossdrive panel, but he made a nice turn to catch the sheep before they ran back to the exhaust and then we were on our way to the pen. At this point, we were farther than we had ever been and Ford had never seen a pen. 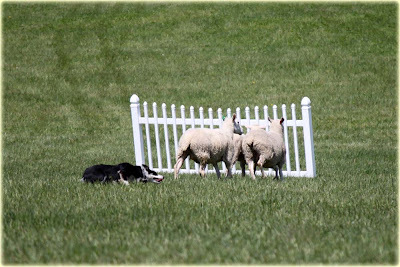 I opened the gate and gave Ford a running flank to guard the far side as the sheep ran in the pen. All Ford knew was that they looked like they were getting away and instead of stopping in the mouth, he continued around to the back of the pen. 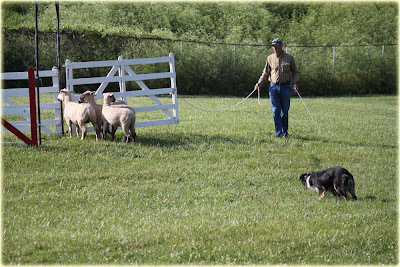 Fortunately, the sheep liked being in the pen and I was able to shut it before they left and then send Ford around the front to show him where to stop, before I took them out again. He got his first score and although it was horrible (36) I was very pleased. He listened and was biddable and gave me what could with the training he had and I was over the moon that he took all his stops! Back to the real competition. Scott ran Wynn next. Wynn was also feeling the pressure on the right hand outrun and needed a redirect but didn't really give enough. The rest of his run was pretty good and was enough to give him a 3rd place. 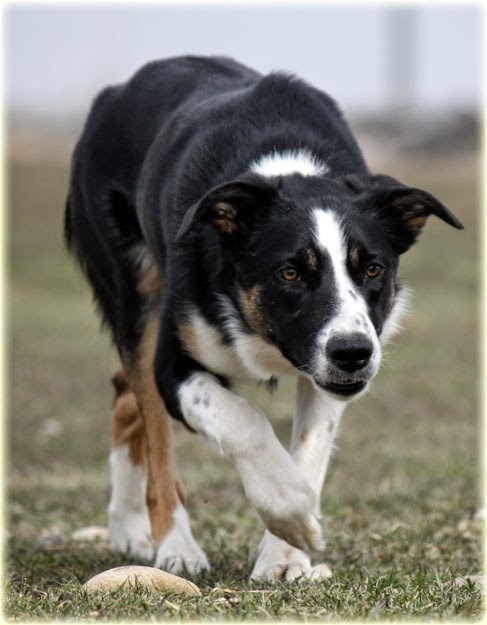 The last dog Scott ran was Marianna Schreeder's Jane. Jane was really good today. She had lost her temper at the last trial, her first trial, but this time there was no hint of that. 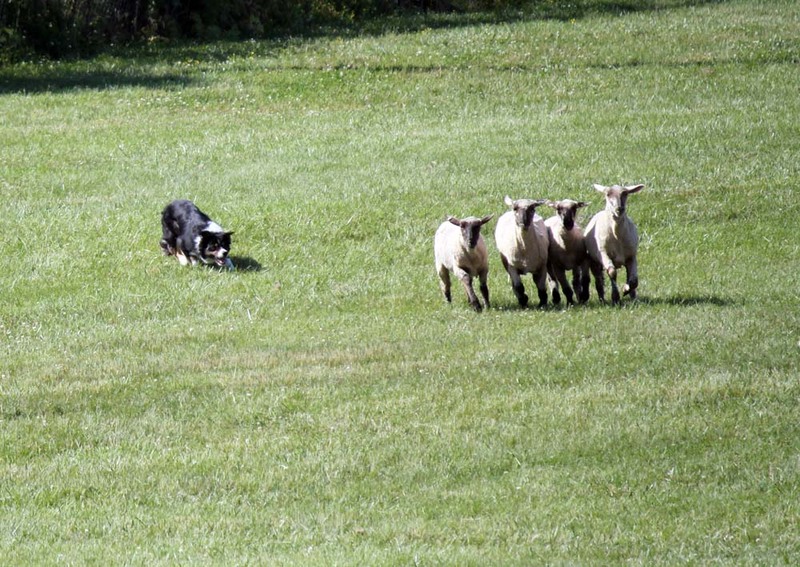 Jane was confident and cool and the sheep liked her. She ended up in 4th place and Scott was very happy with her. 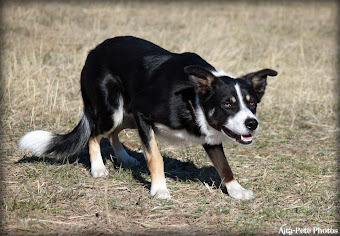 In the ranch class, Scott ran Nan first and she did a great job. She had only one major fault and that was missing the crossdrive panel but other than that she was bang on and nicely won it by 4 points over sixteen year old Kyra Costanzo and her Sue dog who was dangerously close to winning it. This teenager is going to be one to watch when she moves to open because she never gets flustered. Scott also ran John today but it wasn't really fair to the dog. The trial had originally been full and John had lost his spot in the class. Since he was going home to his owner Annette Haithcox this week, he didn't get work while all the other dogs prepared for the trial. When some people canceled, Scott threw John back in. John wasn't bad but because he is green broke and a little out of practice, he had some troubles. He did have a great outrun and lift but the sheep broke back to the set out. John got them back and started around the course but took a wrong flank and got himself in a tight spot so they retired. I'm sure Annette will have him back to his polished ways very soon as they get to know how each other works. In the Pro Novice class, Ford passed this run up but his sister tried it again. This time she had a better outrun to the left, made her fetch panels and had a nice turn before she decided she just didn't know how to drive well enough to move on so Lori retired her. Progress. Ford and Anna will have a rematch in a month in New York at the Fetch Gate Nursery Trial and Anna will have alot more training by then so Ford better watch his back! Scott ran Missy Parker's Tex and he didn't disappoint. He kept his cool, made all his panels and pen and ended up in second place at his first trial with a 69. First place went to Scott and Jane. Jane is really getting the hang of this and smoothly put the sheep through their paces, winning with a 74. We will move on tomorrow and head down to Kentucky to the big show, the Kentucky Bluegrass Classic! We are enjoying our time at this trial in Turbotville, PA despite the terrible job we and our open dogs are doing. 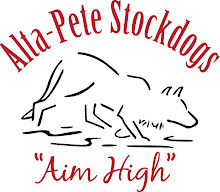 Dave Fetterman puts on a great trial but it just hasn't been working out for our dogs. 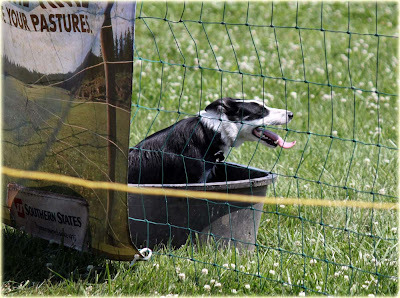 On the first day, June was our only good dog with a 4th place in Open with and 82. It was good enough to add some more points to her trial numbers and she should have enough now to qualify for the Nationals. Don ran late in the day and by then the sheep had rerun this course and had decided that they were done with it. It was difficult to keep them right. He ran well but it just didn't come together. The most surprising part was that he didn't come in on the shed and Scott retired since it wasn't competitive. I did likewise with both of my runs. Hemp was actually running well but that is a foreign concept for me and my timing was off all the way around. It was a pen/shed and I retired at the pen when I knew we weren't going to get any better. Laddie ran late in that bad time and I was a little late lining him out because I misjudged the volume needed on my whistles. A little breeze had come up and it just made the sound a little funky. I blew not so loud whistles to keep it light for Lad but he didn't hear them and I increased the sound but by they we were off line and I just never got it back. I had 4.39 minutes to get a shed and it took me all of 4 minutes to get an opening. However, Lad has reverted back to the sheds of last year,- that is, none at all. He started to come in but when I asked him to flank through, he just regathered. Not good one week before the Bluegrass. It was too hard to get the hole again to train on the shed so I walked off before the timer sounded. Vickie Kidd and Merle ended up tying with Tommy Wilson and Sly and had a run off with Vickie the victor. Today got better and worse. June was early again but they missed the crossdrive panel and then brought them back through. Her highlight of the day was penning sheep #45. 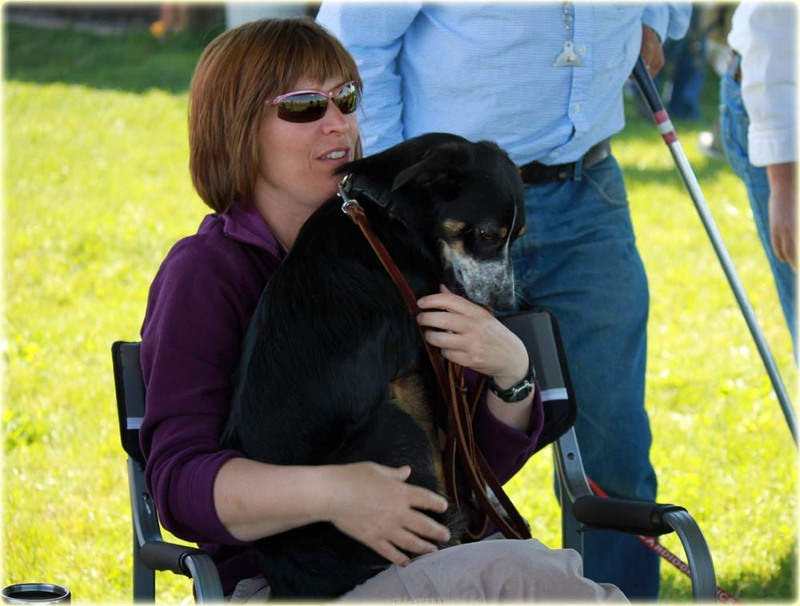 The judge (George Northrup) had stated in the handlers meeting that no one had penned her. 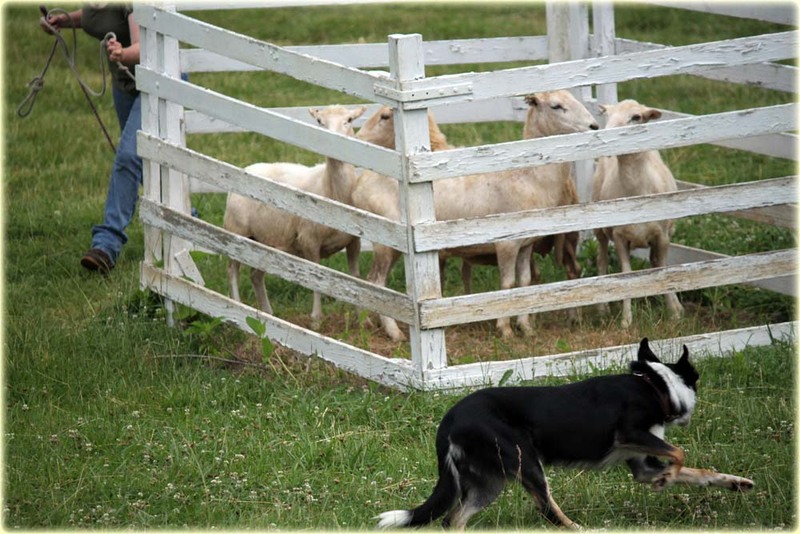 The sheep had been rerun several times and she was not going in. He said he'd stand up and applaud anyone who got her in. Scott and June drew her, and they broke her down and put her in the pen. The judge stayed true to his word and gave them a standing ovation. I believe she got a 79 (I don't have today's scores yet) and didn't place. Hemp ran well until he got to the crossdrive panel, I was low and asked for a flank but it had gotten very hot by that time and when Hemp gets hot, he quits stopping. So he took the much needed flank but stopped late, causing them to miss it high. He got a pen, no thanks to himself. 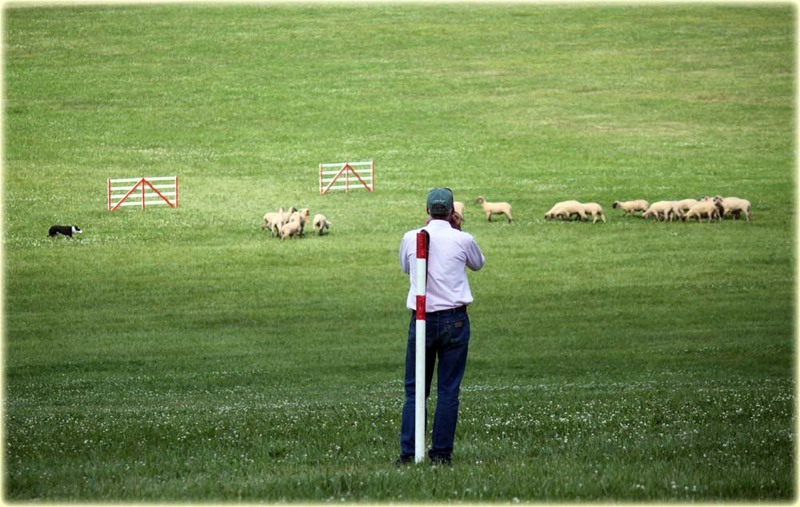 The sheep were running in at that time and you just had to get out of the way. Hemp still sliced that flank (another heat problem) but the sheep went in anyway. In shedding ring. I couldn't get the sheep to respond to me and I needed a flank from Hemp to get a gap but the sheep didn't want to help me and Hemp wouldn't stop when I moved him so we ran out our time in the ring and got a 76. Laddie did a nice job today and I got a few compliments on him including from set out. It didn't score well but he wasn't bad. He made all his panels but had a wide turn around the post. In the shedding ring, I got a gap, called him in, held the single for him and repeated That'll do, THAT'LL DO! until I got him in the gap.He looked at the sheep behind him and then held the single he was supposed to. It wasn't great but made me feel more confident about getting a shed at the Bluegrass. He scored a 75. Don actually did the best today. It was clear he was giving the winning run all the way up to the shed when he again didn't come in to the gap. Scott thinks he was carrying a chip on his shoulder from the last time, last week, that he schooled him on his shed. He said he will have to rethink how to handle the problem. They ended up with an 83. Tommy again tied with the leader today only this time it was Bev Lambert and her young Joe. Again Tommy took second place with Bev edging him out. Tomorrow we run the babies. Ford will meet up in a head to head with his sister, Lori Cunningham's Anna. Neither of us expects to even get the drive. I have, however, challenged Lori to a duel. Since neither pup will have any chance of winning, we will declare our little private competition won by whoever gets the farthest in the course. Next year, we will continue our rivalry for real. I only have the first day scores right now. Joanne Murphy is doing a great job of keeping track of it on her computer and printed me out a copy. I will get her to give me today's copy tomorrow. 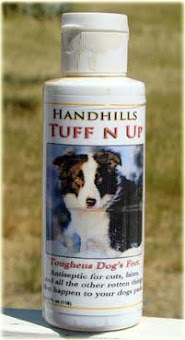 While we are staying a week at the Fleming Farm (Plumb Lucky,) we have been getting some really good work on our dogs. 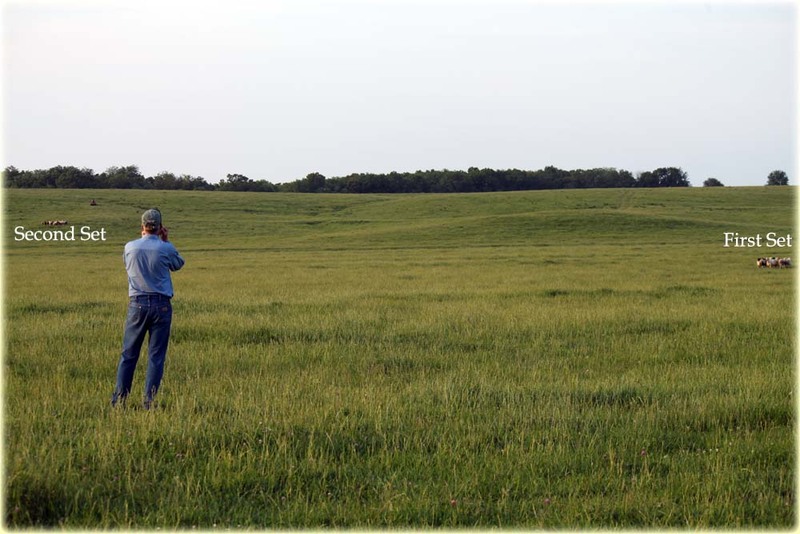 On Saturday morning, before it got too hot, we went to a cow pasture about 15 minutes from the house to work. While we were there, the owner of the field stopped by to say HI. We told him we would be coming back that evening and he said he might stop by and watch us. That evening, as we drove up to the pasture, we saw a sight. Not only had the owner, Mike, stopped by to watch us, he brought about 15 friends, neighbors and their kids! 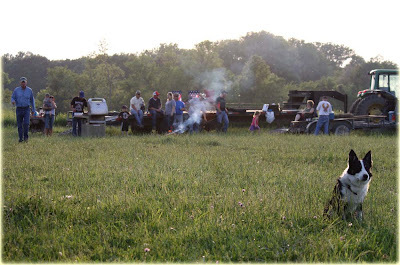 And they brought a tractor and a flat bed, a dune buggy, a bb-q, (and burgers) a camp fire and various dogs to watch. 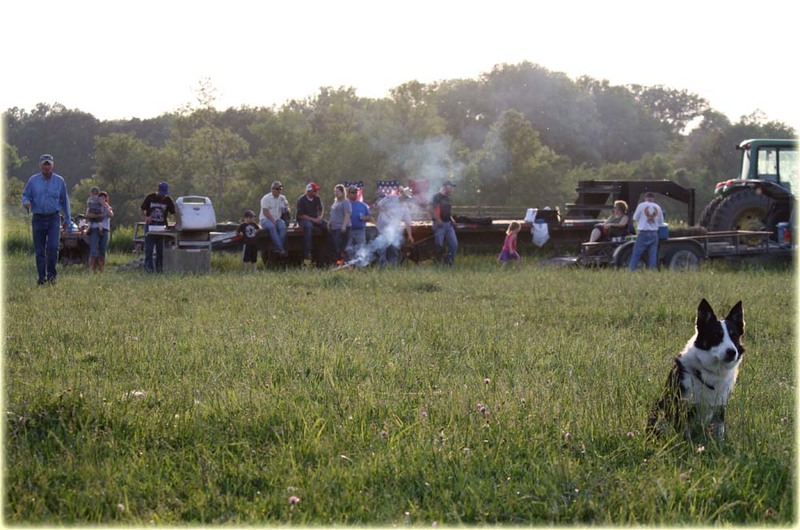 It was a regular sheepdog training tailgate party! It was a blast! Scott and I agreed that working dogs had never been so much fun. The people of Leeton, MO (and the surrounding area) love to come out and support any activity. 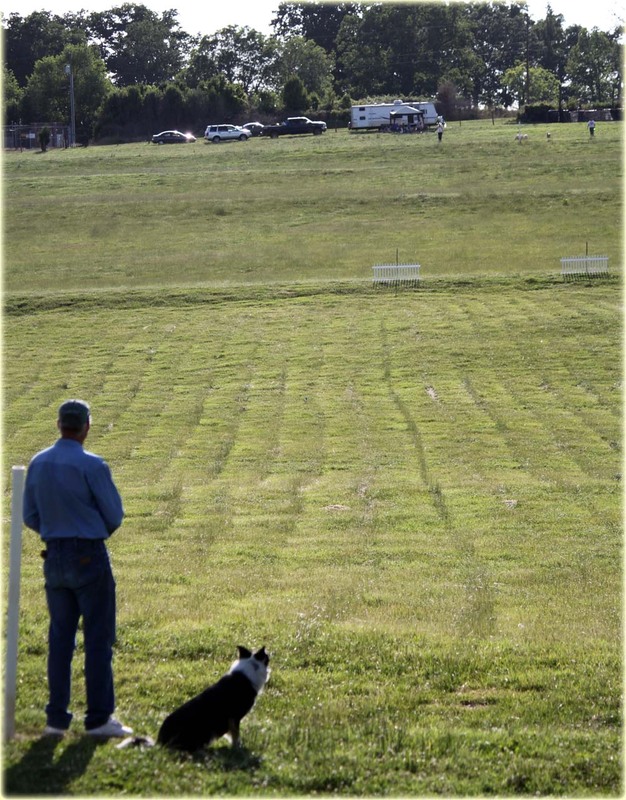 They were very excited that the 2013 cattle dog finals was going to be in their town and all evening they continued to come by and hang out and watch. They only worried that they might be a little loud when we were working. I assured them that it wouldn't bother the dogs one bit and everyone enjoyed themselves. 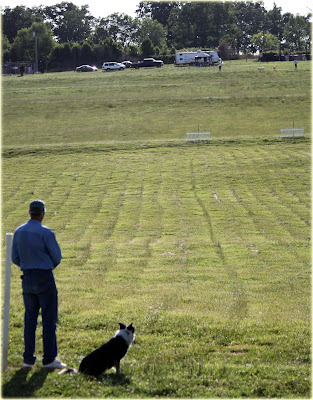 Scott and I and Thad Flemming got quite a bit of work done on our young dog's outruns because the field was flat at the bottom but had some tricky hills to go up. There was also a ditch running through the base of the hills with about 4 inches of running water in it, which made it nice for whoever was setting out to cool their dog. And you couldn't beat the double lift set up! We stayed until the fireflies came out and the camp fire burned down, said good bye to our new friends, and then gathered the sheep to go home by the light of the super moon. 4. 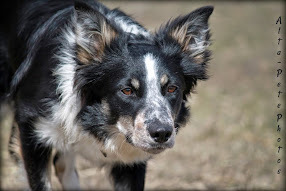 Since Ford now has a stop whistle and therefore also a "there/steady" whistle - I can see glimpses of the dog I really wanted and what he'll become with experience, and it makes me happy.